We’ve updated our .NET Diagnostic Debug/Trace Extension to now include support for TraceSource. The TraceSource class is used by applications to produce traces that can be associated with the application. TraceSource provides tracing methods that allow you to easily trace events, trace data, and issue informational traces. Trace output from TraceSource can be controlled by configuration file settings. The configuration file is located in the folder with the application executable and has the name of the application with the .config file name extension added. For example, the name of the configuration file for TraceSourceSample.exe is TraceSourceSample.exe.config. The configuration file can be used to determine where the trace information is to be sent and what levels of activity are to be traced. There is a getting started guide over on the InsightExtensions site that goes into more detail about configuring this extension. We’ve added additional message types to support TraceSource. These message types are Start, Stop, Suspend, Resume, Transfer and Verbose. By adding support for TraceSource, this allows you to leverage your current investment in this, but leverage the power and flexibility that comes with the ReflectInsight viewer. You can now view your Debug/Trace messages in real-time, in a rich viewer that allows you to filter out and search for what really matters to you. 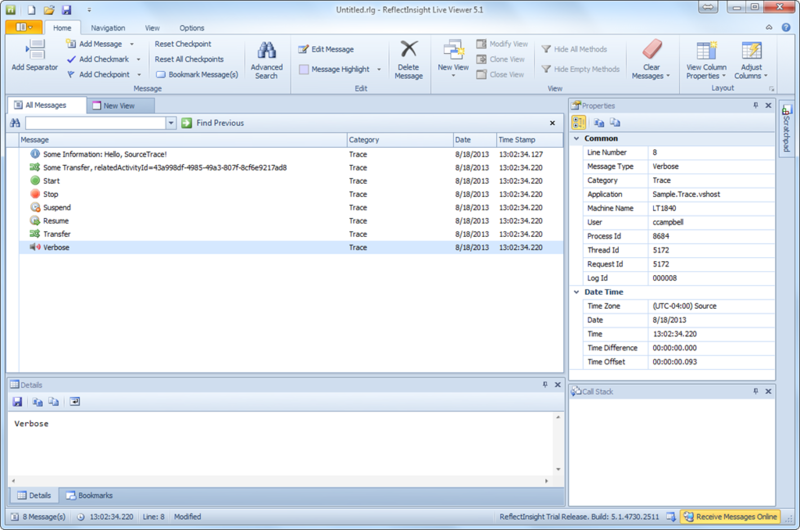 ReflectSoftware is pleased to announce the availability of our next release of ReflectInsight, version 5.1.4730.2511. Improvement: Extended Trial period to March 31, 2014. Improvement: New support for Enterprise Library Semantic Logging. This is available on CodePlex and NuGet. Improvement: Added new message types for Event Tracing for Windows (ETW) Sources. Improvement: Added Email Listener Destination. Available on CodePlex and NuGet. Improvement: General fixes and improvements to the Configuration Editor. Improvement: ReflectInsight Logging Library configuration now includes support for DestinationBindingGroups. Improvement: General fixes and improvements to the ReflectInsight Logging Library. Improvement: Updated the ReflectInsight Viewer to include a new Check for Updates functionality. Please download the latest version of ReflectInsight now and enjoy! We welcome any feedback you may have. Feedback can be given at our UserVoice site.